The phrase, "the lion's share," should be revised to "the lioness's share," because when it comes to putting food on the table, the female does all the work. They not only secure dinner, but serve the males first, even before the cubs. So when the African lioness (Panthera leo), who can weigh up to 400 lbs., wants to take a little cat nap in a shady tree, who is going to argue with her? 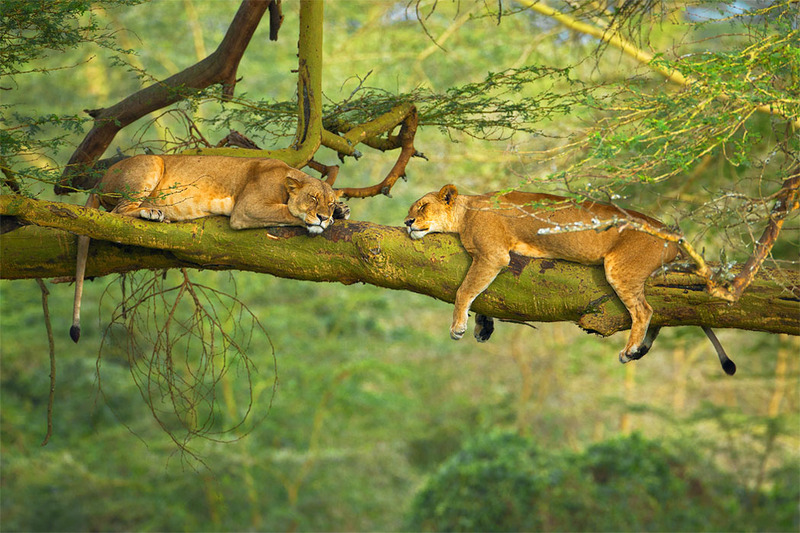 In this photo capture, two female lions, who hunt primarily at night to escape the heat and bugs, are taking advantage of some shade from the mid afternoon sun and stretching out on the horizontal branches of an ancient Eucalyptus tree. After this quick power nap, these two magnificent big cats will once again go out and pursue the lioness's share for their prides.